All of your post above is in agreement with my observations. My twirl energy rises between 1" and 2", then tends to level above 2". But although 1" is small, as I mentioned in my EDC post, a lot of 1" tops are sold and carried in a pocket. I've often said that while we strive for long spin time, it can be boring. Would we play with a top that spun for 24 hours? So, although I'm as susceptible as anyone to the siren song of long spin time, I try to remember that there are other factors of interest. 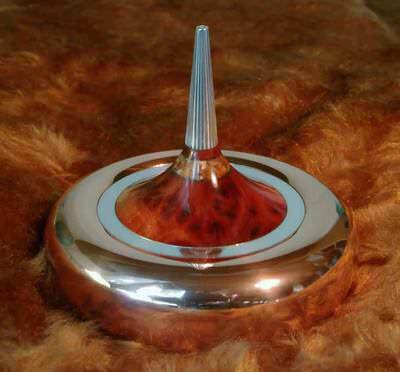 Personally I would find a top able to spin for 24 hours a very interesting object. That said, each one of us is free to choose the aims he prefers, of course. Portability is an added value, but even a 2" top can still stay in a large pocket.. The few times I had to carry my tops, I never found them difficult to carry. There are makers that made much money selling tops of that size. Now that's cool. It looks FANTASTIC with the sharks. Now use little ablone to balance it. Maybe more spin time. the bigger the top, the less the energy transferred from the hand to it with a single twirl, (simply it becomes too difficult to even move it). The Titanic top is hilarious! Thanks, Cecil! Not to hijack Alan's thread, but the top is very close to perfect balance just by virtue of the high precision of LEGO parts. I can fine-tune the balance as needed by sliding the sharks along their rails and adjusting the postures of the life raft occupants. But there is a tie to the discussion of AMI and twirlability. The intermittent wobble is due to flexure of the rotor -- which I could only make so rigid given the design, the size, the plastic material, and my determination to keep the top twirlable by hand. Thanks! This is the part of the Titanic story they didn't want you to know. Personally, I feel sorry for the sharks, who swim round and round but never get a bite to eat. Sharks have to make a living too, you know. Intriguing idea! At 0:57 in the Titantic top video, I use a bulky inline planetary gearbox (single-stage, 1:4 overdrive) as a detaching starter. Unfortunately, that's as compact as a symmetrical inline gearbox can get in LEGO for want of a suitable ring gear, but it would certainly be possible to fabricate a planetary gearbox light enough and small enough and balanced enough to build into a top -- say, at the base of the stem. Hmmm, come to think of it, pump tops already have internal inline gearboxes. And they require only one hand to operate. My stems have a central hole. I use that to stabilize the top if I spin it with a string. I also sometimes push a rod through the hole to eject a damaged tip ball. Many of my smaller tops have approx 6mm knurled stem, but I've made larger tops with larger stems. I tried inserting a 6.4mm knurled stem-extension into a couple of tops to see if this smaller and longer stem facilitated faster twirls. It extended the stem by about 20mm but it didn't help. Here are two I tried. 38mm 92g top with 9.3mm dia stem. I also tried a 100mm wood extension with rubber tape at the top for grip. It resulted in equal average spin speed to no extension, but the weight of the extension caused much earlier topple. 44mm 99g top with 8.4mm dia stem. extended the stem by about 20mm but it didn't help. The clearance between the bottom of your tested tops and the spinning surface is large enough, so that you can spin hard your tops with a short stem without having the problem of the sides of the bottom of the flywheel touching too easily/often the spinning surface during the spinning action. You should reduce that clearance, (recessing the tip a bit more), because you need less of it, thanks to the longer stem. So you could see the advantage, because the overall center of mass would be slightly lower, in spite of the longer stem, (if it is built very light). If the clearance is little, you can see a difference in starting speed, using a short stem instead of a long stem, because it is difficult to spin hard a top with little clearance and a short stem. You simply added a stem extension to your existing tops, which you made with a clearance optimized for their short stems; that is a larger clearance, which already allows for hard spins with no problems, even if the stem is short. So adding to them a stem extension doesn't increase their starting speed. I have plenty of free space below the top, and the top could be tilted a lot during the spinning action, with no problems. The problem here is not tilting, but the resistance to tilting which develops when the top grows in rotational speed during the spinning action. Because of this resistance, the unwanted lateral motions of the hand are transmitted to the top only partially in the form of tilting of the top, then also they are trasmitted to the top as lateral movements of the top itself. This is a problem for me, because the spinning surface of the pedestal is very little. The top tends to exit from the base. The longer stem decreases the change of angle of tilting of the top during the spinning action, and the force that pushes the top out of the base. For this reason I can spin harder my tops with longer stems, on the pedestal. All this is true also for tops with recessed tips. This brings up an interesting design parameter. What is your maximum angle of lean before scraping the flywheel? Currently I aim for about 8 degrees. What is your maximum angle of lean before scraping the flywheel? Currently I aim for about 8 degrees. It is about 4 degrees in my latest tops, and I have no problems spinning them hard on a flat surface, with stems about 70 mm long. If you use a concave mirror, you need more degrees, probably about 5, but this depends on how much concave it is. This is my top Nr. 22. It weighs 656 grams, diameter 80 mm. The upper side is too small for an efficient single twirl, but the lowest side is too large. I can transfer the highest energy to this top with a single twirl when I spin it with my fingers at the height where the knurl has 5 mm diameter. So, the optimal "gear ratio" for my fingers is a 5 mm stem for to move a kg-m2 0.000636 rotor. Accordingly, rotors with less moment of inertia will require smaller knurls, to maintain this optimal "gear ratio". A so thin knurl would offer too little surface in contact with the skin of the fingers, the grip would be too poor, and the fingers would slip on its surface trying in vain to spin it hard. Also, if the knurl is too thin, the two fingers would be in contact each other, and part of the energy would be lost for the friction between the two fingers themselves. This is the real reason why the majority of my tops has knurls with diameter between 3 and 4 mm. It is the thinnest diameter that my fingers can still grasp well. This means that all my tops up to 300 grams have a too large knurl, in the sense that they have not an optimal "gear ratio". 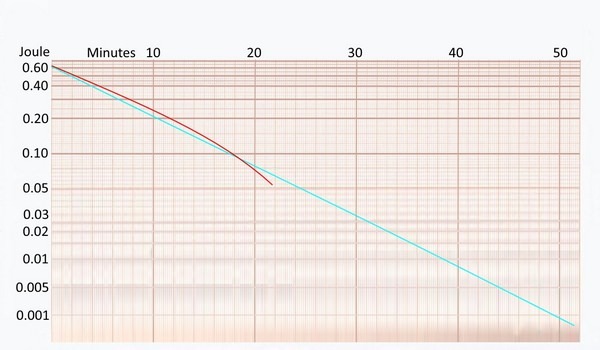 But the red line was cut, and I started it at 0.6 joule, the same as the blue line, for an easier comparison. Reality is that that spin of the Nr. 22 started about 6 minutes earlier, and its initial energy was 1.03 joule. This is much more initial energy than that of my other tops, at first I was unsure what to think about this, and I avoided to mention this fact. But there are not errors in the calculations, this is real. the top Nr. 22 is my real best top as for the energy it can receive by a single twirl. The reason is that it is my only top with a best "gear ratio" and a knurled stem. The other my three giant tops have smooth stems, or a knurl with a wrong size for a single twirl. All my other tops have a less or more unfavourable "gear ratio", because I can't make knurls smaller than 3-4 mm. When designing the knurl of a spinning top, the challenge is not to realize what diameter give to it, for to have the best "gear ratio", because we already know that whatever diameter we choose, is too large, (for a normal size top). The challenge is to design a knurl with the littlest diameter but with enough surface area for the fingers. A way to obtain this is to make the knurl long. Long and narrow. As an artisan, my fingertips are a bit callous, and, maybe, this helps me spinning small knurls. But also I believe that one reason why I can do so is exactly because my knurls are long. The precious surface area lost in width because of a more narrow knurl, is gained again, in length. The knurl is tapered.... The upper side is too small for an efficient single twirl, but the lowest side is too large. I'd put tapered stems on all my "heavy" tops if LEGO parts allowed, but steps are the best I can do. The starting step here is 6.0 mm in diameter, and the finishing step is 4.8 mm. A tapered stem is to a continuously variable transmission as a stepped stem is to a gearbox with a few fixed drive ratios. If LEGO made the parts, I'd try an 8-2 mm taper for my own use. Who knows, maybe I'd expand my twirling skills and top designs. That said, most of my tops perform best with just the 4.8 mm stem -- thanks in no small part to its 4 deep splines and the grip they provide. I only go thinner (here to 3.0 mm) in very small, very "light" tops. But other users -- especially very young kids -- might find more use for 3.0 mm or even smaller stems. We all know what "heavy" and "light" feel like in this context, but as you point out, we're feeling AMI here, not mass per se. Mass reliably tracks AMI only when specific AMI (AMI per unit mass) is more or less constant. My rotor geometries vary a lot more than yours and Alan's do, and their specific AMIs are all over the map. Mass is vastly easier to measure than AMI, but alas, tracking AMI with mass just does't work for me. So, the optimal "gear ratio" for my fingers is a 5 mm stem for to move a kg-m2 0.000636 rotor.... Accordingly, rotors with less moment of inertia will require smaller knurls, to maintain this optimal "gear ratio". An excellent and very practical way to think about this critical design issue. Play value in my tops hinges on getting the stem geometry right -- especially for the low-skill audiences I usually get at LEGO shows. Every hand seems to have its own optimal stem diameters for a given set of tops. The available diameters that work with my hands are 3.0, 4.8, and 6.0 mm. A so thin knurl would offer too little surface in contact with the skin of the fingers, the grip would be too poor, and the fingers would slip on its surface trying in vain to spin it hard.... Also, if the knurl is too thin, the two fingers would be in contact each other, and part of the energy would be lost for the friction between the two fingers themselves. Exactly my experience. Control also gets dicey below 3.0 mm in my hands. I never need to start at more than 6.0 mm at LEGO densities, but the average LEGO show visitor would probably have an easier time if my highest-AMI tops had larger starting steps. So, here it is: the top Nr. 22 is my real best top as for the energy it can receive by a single twirl.... The reason is that it is my only top with a best "gear ratio" and a knurled stem. Exactly the way it works with my tops. Problem is, finding the best diameter(s) for a given top can be a chore even if you're just assembling ready-made parts like me. 1. At the initial instant a torque is applied to the stem and it has not yet rotated. 2. An instant later, the stem rotates away from the applied torque, reducing the applied torque. The lighter the top, the greater the reduction. So the greatest energy transfer would be to a very heavy top. To the degree that the top rotates, there is a reduction in energy transfer. I think it's fair to say that available finger torque generally goes down as stem speed increases. But the rate of energy transfer is the mechanical power given by the product of torque and angular speed (in rad/s). Hence, the energy transfer rate must be minimal at the start of the twirl and at the end and must peak somewhere in between. Look up brushed permanent magnet DC motors to see a reasonable analogy. The applied torque is maximum when the motor's stalled and vanishes as the motor approaches its no-load shaft speed. The torque-speed curve is a straight line between these 2 points. Maximum mechanical power output occurs, not at stall, but at 50% of no-load speed.